State House, Freetown, Tuesday 7 August 2018 – His Excellency President Julius Maada Bio today met a high-level delegation from CARE International, among them Congressmen, to discuss how US investments are leading to sustainable health gains for women and girls. 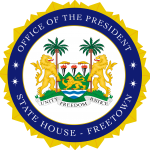 Congressman Norma Torres congratulated President Bio on his victory in the 2018 elections, adding that they were encouraged by the steps already taken by his government to transform Sierra Leone. He described government’s efforts, in the education sector and the desire to cater for women and children, as a pathway to development. He also praised President Bio’s drive to tackle corruption, saying it was a step in the right direction and move to pursue a brighter future. “Your Excellency, we are astounded by your focus on human development. We have heard a lot about your drive in the fight against corruption, which we think is a positive step. We want to work with your administration and to see where we can partner, going forward,” the lawmaker said. On his part, President Bio thanked CARE International for their continued work in the country, which started years ago. He said Sierra Leone had gone through a lot of tough periods, ranging from the civil war, to the Ebola outbreak and the mudslide. He added that his government inherited a very difficult economic situation but assured of his efforts to turn things around and cater for the less privileged in society. He noted that his government had placed education at the top of its priorities because it was not only key to development, but would also serve as a tool to break the shackles of poverty. “Like you all know, we inherited a very challenging economy which we are trying to fix. I have made a pledge that I will provide basic education for every child in our country because we need an educated society to be able to meet the challenges that lie ahead. We need the support of everyone to make this a reality,” he ended. Founded in 1945, CARE is a leading humanitarian organisation fighting global poverty. It places special focus on working alongside poor girls and women. Last year, CARE worked in 94 countries and reached more than 80 million people around the world.